There are plenty of legends concerning Nightmares. 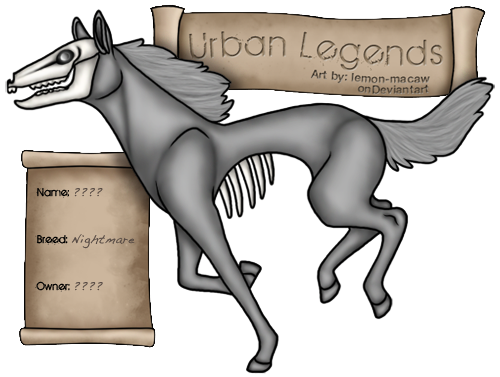 Many times these legends are portrayed in a horse form, but the original legend was much more sinister. 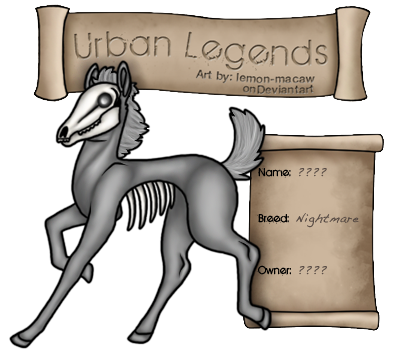 Here at Urban Legends we have chosen to portray them in their horse form. 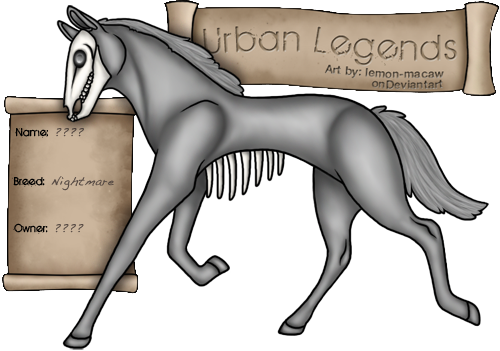 The original Nightmares were often times they were referred to as just a Mare. These demons will ride on the chest of their sleeping victims and create nightmares. The legend dates back to early Norse mythology, but it is believed to be older. Nightmares are also associated with sleep paralysis. The Nightmares here at Urban Legends, however, like to do things a little differently. They still enjoy inflicting terrorizing dreams on anyone they meet. They gallop through their victims dreams twisting and molding them into nightmares. These creatures are extremely mischievous. While they are trouble-makers and get thrills out of seeing others suffer, they usually mean no harm by it. Mara is the original Nightmare and comes off most times as cruel and frightening. She gives the absolute worst nightmares, so this is one visitor you don't want while sleeping. She is very sarcastic, so although her friends may be harsh she doesn't mean much by them. Despite all that she does still have a close circle of friends that she trusts. They see a side to her that no one else gets to see. They understand her antics and love her for it. If you have the chance to befriend a Nightmare you will come to understand these trouble-makers. They may seem standoffish at first, but once you've gotten on their good side you're in for an adventure. These pranksters are constantly looking for way to torture the other legends. While this may seem mean to some, those who understand Nightmares will know it's just the way they have fun. And with a Nightmare there will never be a dull moment.